NEW YORK CITY, NEW YORK -- Kimberly Harris felt a small sense of momentum after winning the Emerging Elite 60 meter final on Friday, at least when it comes to things like confidence. Because if there's anything that provides a significant mental boost heading into a championship event, it's winning. 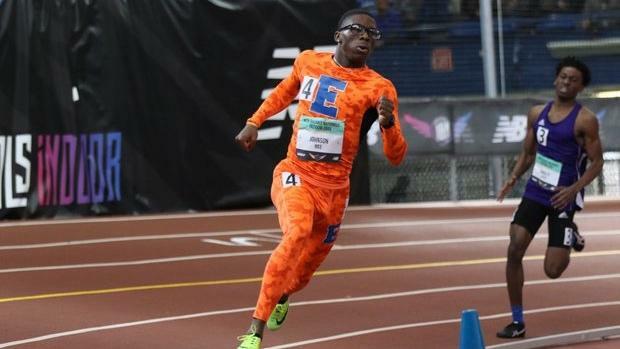 The Buford (GA) High School junior, who is the top combined sprinter in the 60m, 200m and 400m in 2019, did exactly that in the 60 meter EE final, scoring a personal record and US No. 8 time of 7.45 seconds to beat Del'Nique Penn (7.54) and Trinity Rossum (7.56). "I wanted to shock some people," Harris said. "I think this race shocked some people." There was no doubt Harris was qualified to win in this field of Emerging Elite athletes, but in some ways it was just a primer for her overall objective: Winning a 400 meter championship on Sunday. That will be the true prize for Harris, who enters with a US No. 3 mark of 53.58 seconds. Still, she doesn't go in as the favorite, as Run U Xpress freshman Kayla Davis and Mills Godwin senior Britton Wilson also feature in the field. And Harris knows nothing will be guaranteed, either in prelims or in the final, where Davis has beaten the Georgia prep before. But Harris said Friday that she believes she's ready to go after what she wants on Sunday. "There are some people who aren't expecting me to do well in the 400 and are keeping my name out of the top girls and stuff," Harris said. "I just want to show them I can compete. So obviously the 60 was a statement for them and my 300 from this past weekend was also a statement to them. I'm competing for them and I'm coming for them and we're all going to compete." If there was any stress in Nick Cross' life during his rabid collegiate recruiting period roughly a month ago, the DeMatha Catholic senior is now far past it. The University of Maryland football signee and four-star rated defensive back spent nearly a week determining between a previous commitment to Florida State and new suitors Penn State and the Terrapins. But eventually, Cross made a decision, setting in motion a career on the football field next fall in College Park, Maryland. He says he'll also run outdoor track with the Terrapins and will work with Terrapins sprints coach Andrew Valmon. What helped him focus over that recruiting period, he said, was training and competing on the track. "It helped compose me," he said Friday. "I was able sit back and be able to go out there and run and go enjoy myself. It helped me go out there and take my mind off the whole recruiting thing." Cross has high hopes for the final indoor meet of his senior season. He was eighth in the boys championship at New Balance Nationals Indoor in 2018, but this year he believes the experience gained over the past year has been vital toward his improvement. The senior says he's worked on positioning, his drive phase and his hands. "I think it's about position," he said. "Being able to go out and hold my drive phase longer. My coach always says I'm one of the more powerful guys, so I have to be able to use the drive phase to my advantage. And being able to speed my hands up when I accelerate." While he's dealing with a minor hamstring injury, Cross says if he's ready for the prelims on Saturday he'll race. He wants to best his PR of 6.68 from last year. It's smooth-sailing from here on out for Cross. "It's a good situation being around good people, being comfortable, and for people who know me and who've known for me," he said. "They put me in a place for success." To say Willie Johnson was worried would be an understatement. The East St. Louis junior sprinter set a high mark in the Emerging Elite boys 400 meter race on Friday in 48.39 seconds. In Section 1. Ultimately, he spent the next 10 minutes watching heat after heat, hoping his time would stand. "I was worried they would knock me down," he said. In the final section, as some of the fastest boys in the event set to the track, Johnson couldn't watch. He walked outside the facility. "I thought I was going to lose," he said. Eventually, Johnson turned his head back toward the glass and saw the time. No one broke 49 seconds. His teammates mobbed him in the moments afterward. "I came back in and I jumped up and down," Johnson said. This was bigger than one win, though. Last April, the East St. Louis track team lost its outdoor season after a fight in the stands of a track meet, which prompted the school district to cancel the remaining meets on the schedule. That devastated Johnson -- and his teammates -- and at one point the sprinter considered quitting. But those around him encouraged him to be patient. 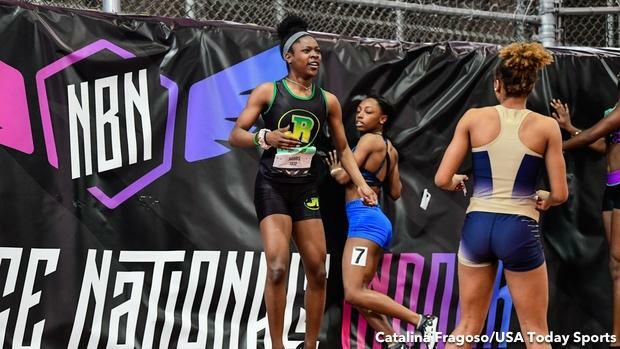 Johnson eventually came back to the track over the summer period, eventually posting an outdoor best, and a huge win, at the AAU Junior Olympics in 47.82 seconds. "I kept going," Johnson said. "I worked hard that summer time." Maybe it is all working out. Johnson said his district paid for the team to fly to New Balance Nationals Indoor, a first for the team and for many of its athletes. Johnson flew on plane for the first time in his life. And so as Johnson stepped on the track Friday, all that was left was competing. He said he vowed to make it special. "It was really important for me," he said. To say Noelle Adriaens has been a late bloomer might be undercutting it. The Pinckney senior never won a state title in Michigan over her cross country career. She never qualified for a national race. But something clicked in February, and maybe the signs of an elite runner started to show. The future Michigan State University athlete finished ninth in the 6K at the USA Junior Cross Country Championships on Feb. 2 and then followed with a ninth-place performance in the 6K for Team USA at the North American Central American Athletic Conference Championships later in the month, crossing the line third for the Americans. On Friday, Adriaen's added her first domestic national title, winning the girls 5K at New Balance Nationals Indoor. "I was going for an All-American (originally)," she said. "That was the main goal. But going for a national champion, it's amazing. When I found out where I was in the race, I wanted it so bad. I'm not going to let anything stand in my way for it. So I just went for it." Michigan's Jeff Hollobaugh has been Adriaens' coach over the last few years. He said on Friday the progression on her long runs made all the difference. Adriaens agreed. "I started finding as I bumped up mileage more, long run days was my favorite day of the week," she said. "I just go out there and settle into a pace. Sometimes it will be ridiculously, almost as fast as my tempos. I get into this comfortable state. Distance races are all strength and stamina. People see that you have 25 laps on an indoor track and that can be really detrimental to your mental state. You have to go for it. You have to realize this is all strength."